Happy Birthday, Helena! This is such a beautiful story of an HI journey with a happy ending, as told by Helena’s mom. Branka, thank you so much for sharing it! Please read and share to raise awareness. 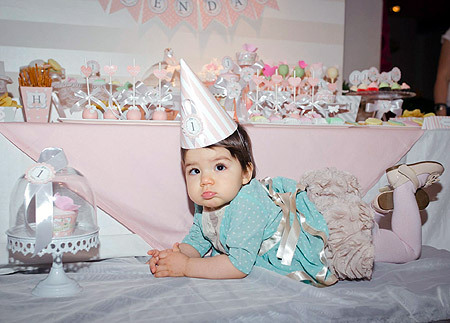 We have just celebrated Helena’s first birthday (A little late). She was all dressed up, cute and HEALTHY. Now when I look back, it is hard to write Helena’s story. She was born in January 2015, as a normal healthy child, marked 9/10. Who knew that on that day a year later she would be in Berlin having a PET scan. Her HI story began on April 11th 2015, when she was 3 months old, and she collapsed at home after an afternoon walk. I remember we rushed to the ER, she was unconscious but her eyes were open, motionless. At the ER, after the examination, the doctors said she was just fine and sent us to the clinic for a thorough examination where they checked her blood count which was all right, and sent us home. Unfortunately, they didn’t check her blood glucose level. That incompetent and superficial examination jeopardized Helena’s conditions even more. The next morning we took her to her pediatrician, who said she thought everything was fine with Helena. My husband and I decided we should take her to get an EEG, and we did. It was her first EEG examination which showed normal brain activity. No one thought Helena should stay at the hospital for a detailed examination, and we couldn’t convince them that something was wrong with her. Days passed and she start to shake every now and then. We just couldn’t convince doctors that her condition was not normal and that we should be taken seriously. Two months after the first episode of unconsciousness she had a really bad seizure, and my first thought was, “Oh God now it’s too late.” She was hospitalized finally, and her blood glucose was measured, it was 1,2mmol/l. We were urgently transported to Belgrade, where we stayed for a month and a half. The first two weeks doctors couldn’t figure out what was wrong, they couldn’t make a diagnosis. Everything they examined was just fine and all reports were just right. Even her insulin level was ok as well. Except the second EEG that we had done in Belgrade showed slow brain activity. She also had a confused look and didn’t react on sounds. The doctors told us she was blind and deaf. Those words broke my heart. But soon after that, she started to react. Examinations showed she was ok in that matter as well. However, I lost the ability to breastfeed a few days after, and this was a problem because she had never accepted a bottle, nor any other kind of solid food. It was almost impossible to feed her. Unfortunately, doctors never told us about the possibility of a G tube. I can’t tell you how hard it was to feed her. That was maybe the hardest thing for us to do. And food was the only thing that would help in order to turn off the infusion of glucose, which she had for more than a month continuously. She needed it to maintain a normal glucose level, especially since she didn’t respond to diazoxide. Anyway, only after several measurements was it obvious that the insulin level was slightly above normal. The doctors consulted the Hyperinsulinism Center at GOSH in London. They immediately referred us to do genetic analysis. We sent blood to Exeter in the UK and learned Helena has an ABCC8 mutation, inherited from one parent. We were advised to do a PET scan. And that was where we hit a wall. No one in Belgrade nor in Banja Luka considered this urgent and they did not advise us to take further steps. The doctors didn’t have experience with hyperinsulinism, they didn’t know where and how to do a PET scan. Then we found out about the Hyperinsulinism Family Conference held in Barcelona sponsored by Congenital Hyperinsulinism International and Hospital Sant Joan de Déu. We packed our luggage and flew to Barcelona where we got all the answers to our questions and all relevant information. There we met Dr. Winfried Barthlen, who turned out to be the light at the end of a tunnel. We decided to focus on the Greifswald clinic, where he worked. When we got our Insurance Authorization that we had the green light to go, it was one of the happiest days for us, as well as her birthday when she did the PET scan and we got confirmation that it was focal form and surgery and a cure were possible. It was a great surgery. For now on we will celebrate her birthday on the actual day as well as the day of her surgery, when she had a chance at a new birth and new life. She has recovered so fast after the surgery, and started to progress. We struggled with feeding until the day after the surgery, when she actually started to have an appetite, which was so new for us, and odd that she actually was hungry. We are so happy and thrilled with every new day with her, because there is something new every day.